TWO LEGENDARY INDUSTRY BRANDS. ONE OUTSTANDING EXPERIENCE. 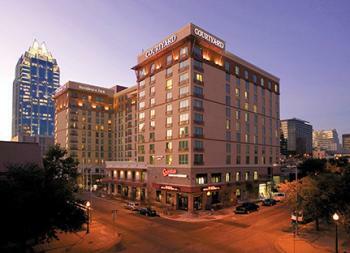 Located in the heart of downtown, the Courtyard and Residence Inn by Marriott is the ideal home base for conference delegates looking to meet and play in Austin. The uniquely designed hotel brings the comforts of two Marriott brands together offering 449 oversized guest rooms and suites; shared professional meeting and recreation facilities; on-site Champions Restaurant & Sports Bar; and Starbucks Coffee Shop. Made for business travelers, the property is within steps of the Austin Convention Center and the city&apos;s famed Sixth Street; Rainey Street; and, Warehouse Entertainment Districts. Guest rooms are comfortable and functional, featuring separate work and sleeping areas with freshly renovated oversized Courtyard guest rooms and Residence Inn suites with fully equipped kitchens. Guests enjoy complimentary high-speed Internet access; complimentary access to the fitness center, sun deck and indoor pool; in-room delivery service from Champions Restaurant & Sports Bar; guest laundry and dry cleaning service; and valet and self-parking. Residence Inn guests enjoy free buffet breakfast in Champions Restaurant as an upgraded benefit with this brand. Business meetings are a snap and planners can relax knowing the hotel accommodates meetings and groups with a multitude of setups spanning 6,600 square feet of meeting space across eight meeting rooms, a Boardroom and Rooftop Terrace. Customized on-site catering is available for events large and small, from corporate to social gatherings.